During the meeting, the Internal Affairs Minister recounted the existing bilateral relations between Liberia and Ireland, also alluding to Irish contributions through manpower to UNMIL military and support during the fight against Ebola. Honorable Sirleaf used the meeting to provide updates on programs and activities of the Ministry of Internal Affairs including the rollout of Liberia's Decentralization, Peacebuilding, Communal Farming and Boundary Harmonization programs, among others to which he called for Iris support. The Internal Affairs Boss has been mobilizing donor support towards the Propoor Agenda for Prosperity and Development (PAPD). He said full implementation of these programs will enhance social cohesion, peacebuilding and development of Liberia. In response, Madam Brady praised Honorable Sirleaf for the brilliant presentation and for clearly articulating programs and activities and expressed desire to collaborate with the MIA in many areas where Irish Development Strategy falls. 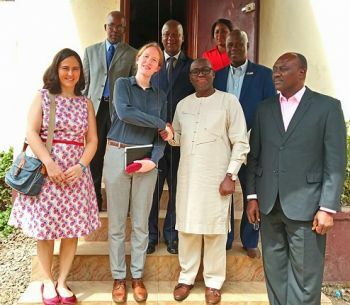 Meanwhile, Madam Brady announced that as a result of Liberia's commitment, Ireland has decided to open a full fledge Embassy in Liberia this March. Irish Government has been running its diplomatic mission through an embassy in Sierra Leone.